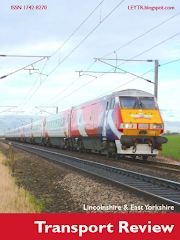 I travelled between Oxford and Peterborough today in order to sample two of what are regarded as England's longest regular stopping bus services, in both the time taken for an end-to-end journey as well as total mileage travelled. 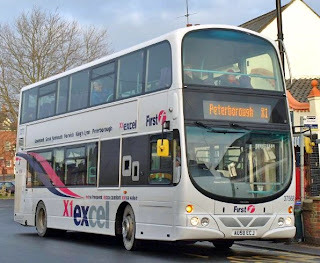 You may be aware that one of the longest bus services in the UK operates in the metropolis of the West Midlands, being National Express West Midlands' circular Service 11. 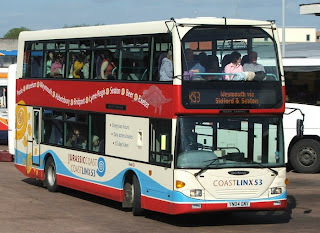 The award goes to First Dorset's Service X53 Poole-Exeter. The table has gone for 'longest' to mean 'duration', rather than mileage. 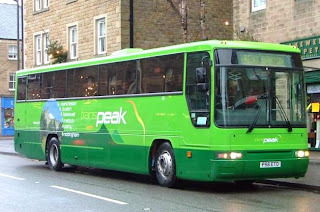 The route with the highest mileage appears to be a summer-only Stagecoach journey between Manchester-Keswick, operating as Service X8. 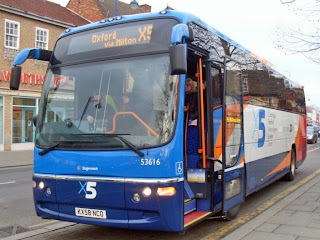 The longest 'regular' service, with a 30-minute frequency, is the recently-upgraded Stagecoach in Bedford Service X5 Cambridge-Oxford, with an end-to-end distance of 120 miles, closely followed by First's Excel Service X1 Peterborough-Lowestoft, covering 115 miles betwixt both termini. 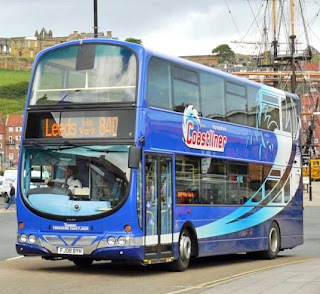 Stagecoach operate 11 of the 23 services and are therefore technically the operator who run the longest regular stopping bus services in the UK. In a poor second place with 5 entries is Arriva; in third place is Transdev's Yorkshire Coastliner with 3; fourth is First with two; and joint fifth are Trent Barton and National Express West Midlands (NXWM) with one service each. The table isn't dated, although the correct name given to NXWM would indicate it is fairly up-to-date. The foot of the table details National Express' coach network's registered sections of route, the lengths of which have to accept England's Free Concessionary Scheme (we were the first to upload this last year) as well as looking at these registered sections of route and listing them in terms of length of time.